This is one of the most bittersweet novels I’ve read in a while. I knew what was coming, but that didn’t stop tears from welling up in my eyes. I stayed awake until 3am to finish reading this book. I couldn’t put it down. On one side stand the evil forces that will not stop until they have Amelia under their control. They give her an ultimatum…she must give herself over to them, or they will kill someone she cares about every week until she gives in. On the other side, the forces of good offer her the chance to join them and save souls. The one thing both sides have in common is Amelia won’t be able to see Joshua again. The relationship between Amelia and Joshua was heart-achingly beautiful. The love between them is so obvious, it’s practically a visible tie between them. Their love makes them stronger as individuals. They don’t try to stop each other from making the choices they need to make. Their relationship is what good, healthy, amazing relationships should be. The secondary characters play a huge role in this novel. They are there for support and make Amelia stronger, more ready to face her personal demons. She trusts them to be there for her when she needs them most and they are there. Amelia gives back as well, being a friend to Jillian and creating friendships that will leave a lasting impression. I could see how the novel would end from early on. Hudson doesn’t take the easy way out, that’s for sure. I spent most of the novel getting ready for the end, savoring each word on the page, not wanting to miss anything. Without giving away too much, the ending is not that of a fairy tale, but it’s what the series deserved. 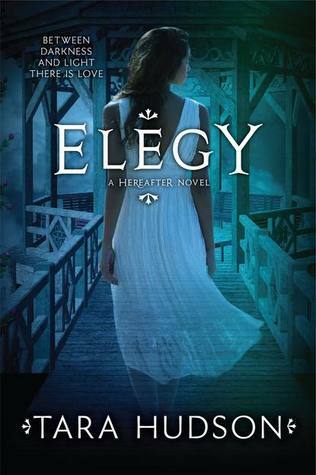 Elegy is a touching, bittersweet, heartbreaking, make-your-heart-soar book that ends the Hereafter series in the way it deserved. It brought tears to my eyes, but the good kind. To put it simply, Elegy is beautiful. This entry was posted in Something a Little Different, Young (and New) Adult and tagged Fantasy, Must Read Series, Must-Reads, Paranormal, Supernatural, Tara Hudson, Young Adult.